The Barcelona fans will have their own space in Madrid on 27 May. The supporters who travel to the capital for the Copa del Rey final against Deportivo Alavés will be able to enjoy a variety of activities before heading to the Vicente Calderón. The Fan Zone will be in the Antiguo Matadero park on Paseo de la Chopera in Madrid. There will also be an information point to answer members’ questions in both the Fan Zone and the stadium. Live shows: Between 11.00am and 7.00pm, there will be live performances on offer. The DJ Edu Naranjo, of Los 40 Principales, who will be playing live throughout the day to get fans dancing to the rhythms of batucada and txaranga. You’ll also be able to check out one of the best freestylers around Jose Ferreras’ football skills. The main act for the day will be Ramon Mirabet’s live performance on the Fan Zone’s stage. 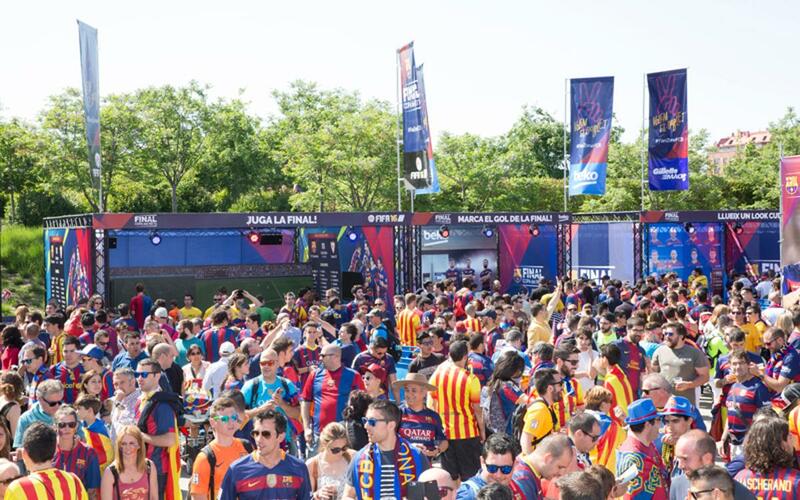 Barça TV set: The blaugrana Fan Zone has reserved a space for a Barça TV set from where they will report on the day’s events and the atmosphere in the fans zone. Workshops and activities: To make the wait until kick-off more entertaining, the supporters will be able to take part in a whole range of activities: they can try and score a goal against the best keeper in the world, hit the FC Barcelona target, measure their strength with the shot meter, take aim with the football, play with car simulators or take part in some human-sized table football, take special photos, or get their face painted by one of our roaming face painters. Finally, if you participate in the sweepstake you might win a prize as among all those who take part one lucky person will win a special Copa del Rey final shirt. Food zone: There will be two areas with bars and food trucks as well as a rest area with mobile phone charging points. The fans can also win prizes by sharing their photos on social media with the hashtag #CopaFCB. If you take part, you’ll be in with a chance of winning a Barça shirt for the 2017/18 season. Moreover, those who share the best photo of the day along with the hashtag #lafotoestrella, will be in the running to be one of the six winners of two-person tickets for the Joan Gamper Trophy.